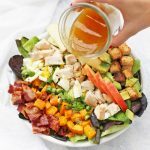 Fall Cobb Salad with Rosemary Croutons and Cider Vinaigrette – This delicious autumn take on a classic Cobb is the perfect fall or winter salad! This post is written in partnership with Canyon Bakehouse. All opinions are my own. Thank you for supporting me as I work with brands we love! 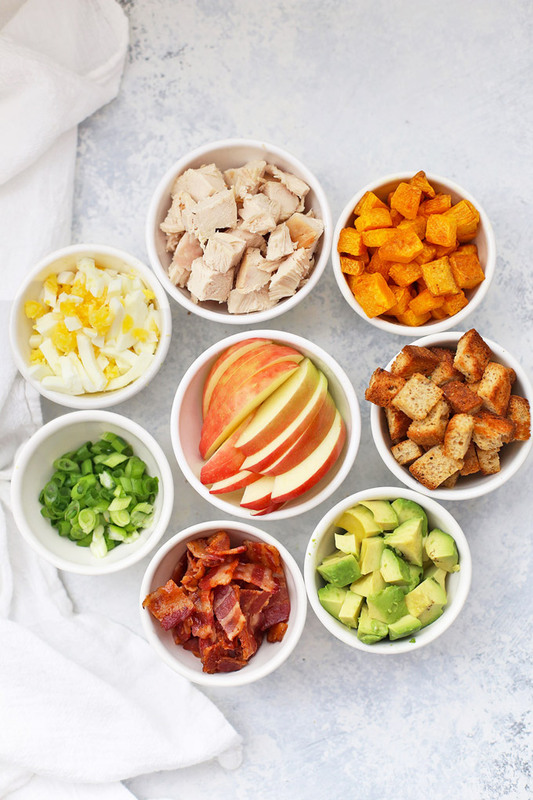 EAT COBB = Eggs + Avocado + Tomatoes + Chicken + Onion + Bacon + Bleu Cheese. See? So many goodies! Since Cobb salads became popular so many years ago, there have been endless riffs on the classic. Some people put the bleu cheese into a creamy dressing, some people swap out the chicken for ham, or add some extra veggies, like cucumber and carrots, or even things like black olives. 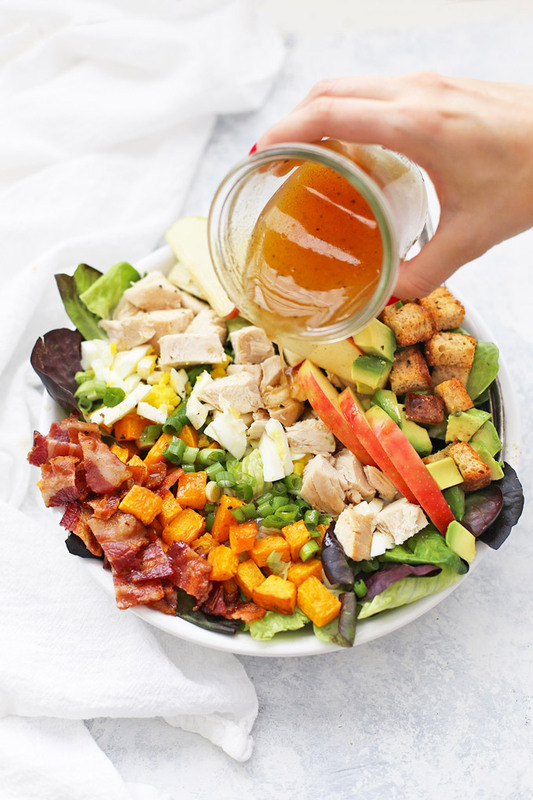 I’ve done lots of variations myself, but I’ve got to say, this fall Cobb salad is one of my favorite twists. I swapped out some of the summery parts (like tomatoes) for an autumn twist. I used some Honeycrisp apples (my favorite!) and some roasted squash to fill out the veggies, and instead of a classic vinaigrette, I made a cider vinaigrette which complements the flavors so nicely. 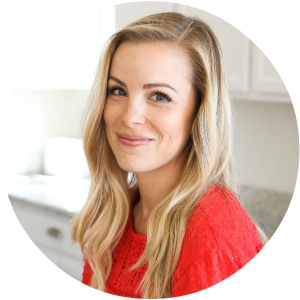 I love that you can use chicken OR turkey here, which makes it the perfect way to use up Thanksgiving leftovers! I just love the blend of flavors, especially with the rosemary garlic croutons. My kids will happily enjoy salad night when there are croutons involved. I usually serve the different components separately so everyone can add what they like. Milo will load up on the bacon, chicken, and croutons. Sophie will favor the apples and eggs. Everyone can find something they love, which means one less dinnertime battle! You can use a fresh loaf of bread or save the ends from a few loaves until you have enough to make a batch. Canyon Bakehouse always comes through for us. Their breads and bagels all have an incredible soft, pliable texture and feel and taste like the “real” thing. Their Heritage line of breads is perfect for family meals since these homestyle loaves lend a homemade feel. We love the Heritage Honey White and the Heritage Whole Grain. Both work for this recipe (and so many others!). SWAPS AND SUBSTITUTIONS: There are so many ways to play with this salad. Don’t like avocado? Skip it. Aren’t into squash? Try sweet potatoes or some halved grapes. Try tossing in seasoned roasted squash or a mix of apples and pears. You can even drizzle this with a different dressing if you like, or add some extra veggies. It’s very forgiving! Powerhouse Quinoa Salad – Another great fall option! 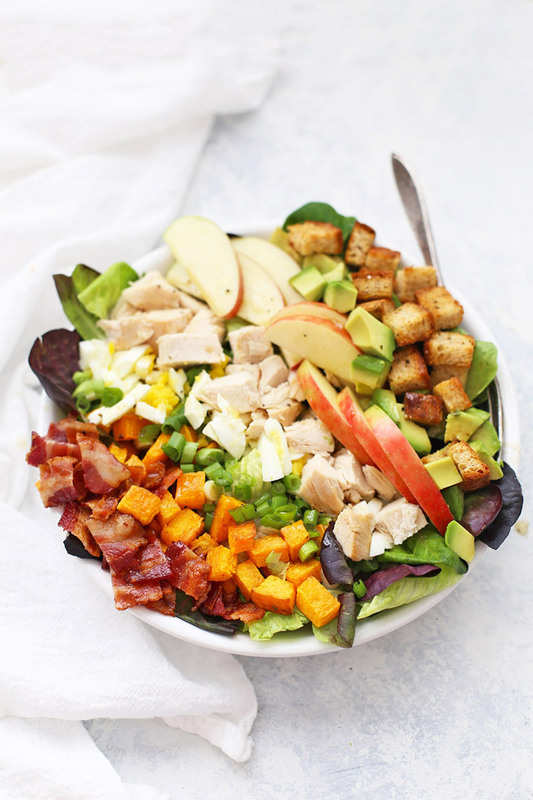 Apple Apple Chicken Salad – Lots of apples in this yummy salad! Gluten Free Crispy Chicken Tenders – Crispy and amazing. 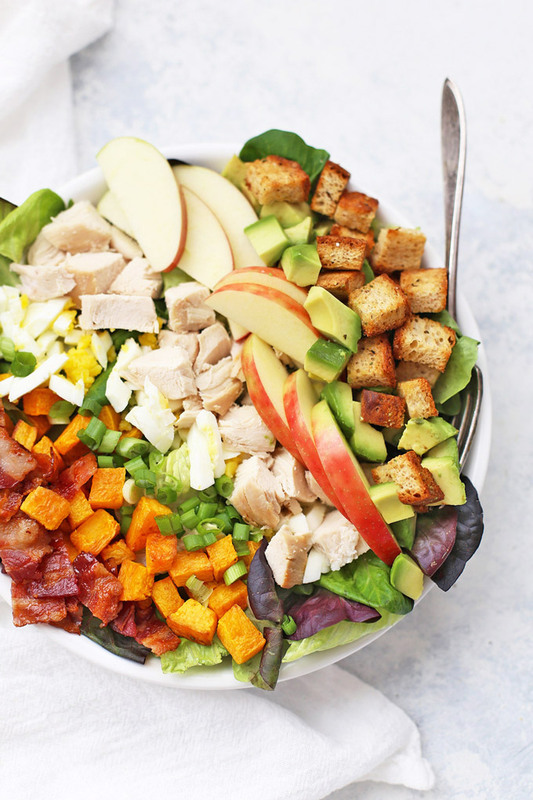 Leftovers would even be good on this salad! 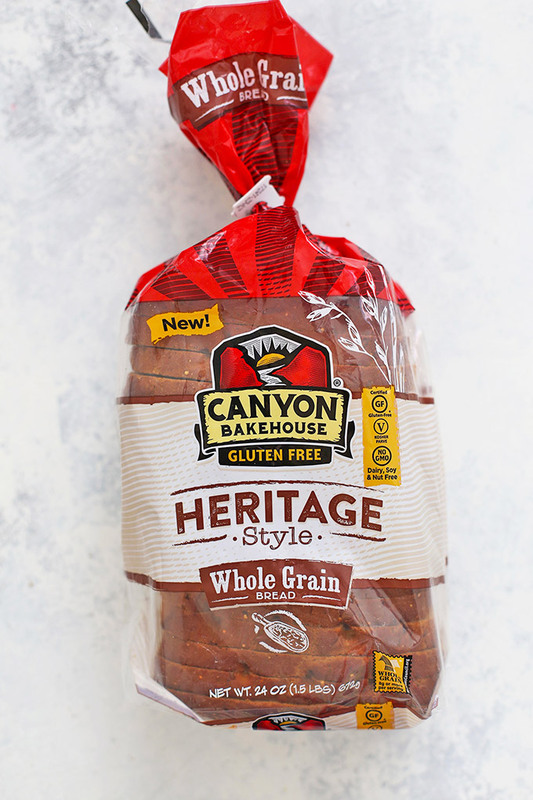 Find Canyon Bakehouse products near you here or sign up for a coupon. Don’t miss the bagels (the cinnamon-raisin is my favorite! ), their classic loaves of bread, and their specialty buns, brownies, and more! For Paleo & Whole30 – Swap out the rosemary croutons for pumpkin seeds, toasted pecans, or almonds. They all give the perfect amount of crunch! Bake at 375 degrees 15-20 minutes stirring every 5 minutes or so for even browning. Place all ingredients in a jar or small bowl. Whisk until well combined (or put a lid on your jar and shake to combine). Make a bed of lettuce. 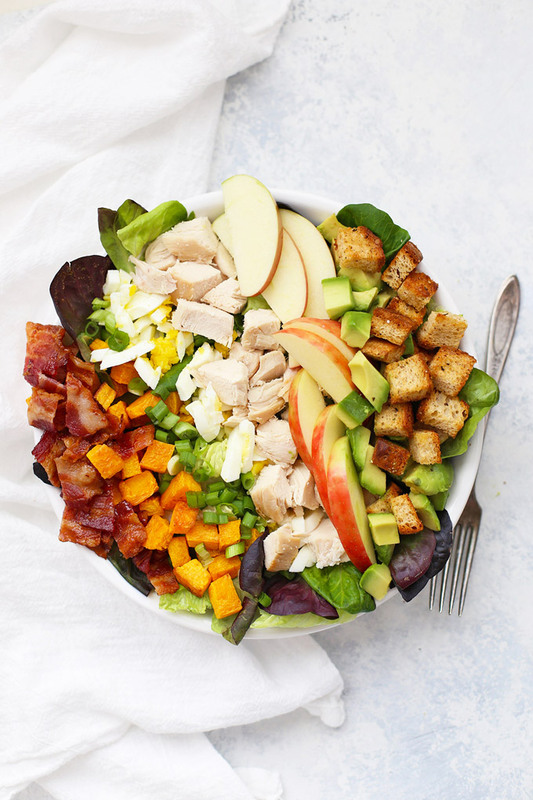 Top with chicken/turkey, bacon, green onion, eggs, apple slices, squash, avocado, croutons, and vinaigrette. Store extra vinaigrette in the refrigerator up to 1 week. This looks beautiful and delicious! I wish I was chowing down on this right now! Thank you Paige! We couldn’t get enough! The flavors were so good together! That looks so good!!! I love the idea of adding squash! It’s such a yummy addition!